The drawing of Ezekiel's temple reveals a cross, tomb, and the river out of the east gate, which symbolically represents the resurrection (see larger drawing under the introduction section). This is wonderful evidence that it is the pattern for the church as the author shows in the book. This pattern for the church has not yet been built. God's church will be built according to His pattern now that we are in the third millennium. Have you ever been bored in a church service? They are not supposed to be about just sitting and listening to a sermon. This books shows what a church should be like. Bob reveals hidden mysteries of the wedding of the Lamb and the birth of the male child in the book of Revelation. He uses ancient biblical and Jewish customs as well as over 20 years of research and spiritual seeking to mine many jewels from Revelation. Learn what it takes to become the bride of Christ so that you will not miss the wedding as well as many other mysteries. Click here to learn more. How do you get sound doctrine anyway? Bob asked this in prayer one day, and to his surprise it was as if the Lord was waiting for him to ask that question. He immediately saw in his mind the floor plans of Ezekiel’s Temple that he had drawn and written about in his first book. The Holy Spirit was pointing out some details of those plans. It was just a clue and would take many more months of seeking, praying, fasting, and studying to get the rest of the revelation. But Bob knew in that instant that the Bible contained its own system for proving doctrine. Paul said to put on the breastplate of righteousness in Eph. 6. This book teaches that the 12 gems on the breastplate of the high priest of Israel representing the 12 tribes are symbolic of 12 virtues needed to rule and reign with Christ in the next age. 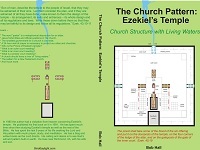 This is Bob's first book in the his series on the Tabernacle furniture. This book is about the table of showbread or bread of the Presence found in the tabernacle of Moses.